An unmanned Japanese spaceship soared into orbit from an island launch site Friday (July 20), beginning a weeklong journey to deliver vital supplies to astronauts living on the International Space Station. The H-2 Transfer Vehicle-3 (HTV-3), nicknamed Kounotori 3 (Japanese for "White Stork 3"), is delivering student science projects, a new camera system, as well as food and spare equipment. It is due to arrive at the orbiting laboratory in about a week. 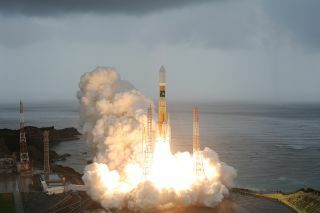 Kounotori 3 lifted off atop a Japanese H-2B rocket at 10:06 p.m. EDT (0206 GMT Saturday, or 11:06 a.m. Japan time Saturday) from the Tanegashima Space Center in southern Japan. It is the third of its kind to fly, following the flights of HTVs 1 and 2 in September 2009 and January 2011, respectively. Among the spaceship's 4 tons (3,600 kg) of cargo are two science experiments designed by the student winners of the YouTube Space Lab competition. Students from around the world between the ages of 14 and 18 were invited to design space station experiments and describe them in videos submitted to YouTube. Then public users of the site voted on their favorites. The winners, Amr Mohamed, 18, of Alexandria, Egypt, and Dorothy Chen and Sara Ma, both 16, of Troy, Mich., designed projects to study how microgravity affects the hunting strategy of zebra spiders, and to investigate how different nutrients and compounds affect the growth and virulence of bacteria grown in space. Chen and Ma were on-site at the Tanegashima Space Center to watch the launch of their experiment, while Mohamed elected to travel to the cosmonaut training center in Star City, Russia, for his prize. The Japanese cargo freighter is also carrying a new camera for the space station, called the ISERV (International Space Station SERVIR Environmental Research and Visualization System), which will observe disaster sites on Earth and other areas of interest for environmental studies. Scientists on the ground will be able to direct the camera via remote control. Today's launch was the second space station-bound voyage in a week. A Russian Soyuz space capsule launched on Saturday (July 15) to ferry three new space station crewmembers to orbit. But the space station action won't stop there. On Sunday (July 22), a robotic Russian Progress cargo ship already parked at the space station will undock from the orbiting lab as part of a two-day test of rendezvous systems on the outpost's Russian segment. It will redock at the station on Monday. Then on Aug. 1, a new Russian cargo ship will launch toward the space station and -- for the first time -- dock on the same day. The acclerated docking plan will test new methods to cut down Russia's typical two-day flight time to the station for Progress and Soyuz spacecraft. The $100 billion, football field-size laboratory is currently home to six astronauts from three countries: the United States, Russia and Japan. Japan's robotic spaceship is one of a fleet of similar unmanned vehicles that service the space station, including spacecraft built by Russia, Europe and a new entrant from the commercial U.S. company SpaceX. The only vehicle currently capable of flying humans to the lab is Russia's Soyuz, though SpaceX's Dragon is designed to eventually carry astronauts as well.